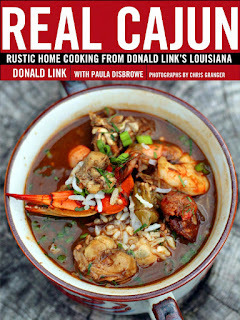 Reading Donald Link's Real Cajun:Rustic Home Cooking for Donald Link's Louisiana, it is not hard to fathom gaining 40 pounds! Unlike some chefs who end up in a place, or move to an area, of like the climate and choose to open a restaurant, Donal Link grew up in Louisiana. "My two sets of grandparents lived a quarter mile from one another, and we settled about a mile from them. Between my mother and father , I have thirty-four aunts and uncles. That's ten brothers and sisters on Mom's side and seven on Dad's." A truly inconceivable fact to grasp for an only child! During a particularly popular wave of Cajun cooking, fish got blackened to the point of extinction, and over-bearing spices removed and distinction between flavors. That was not the food Donald Link grew up eating. It is no surprise that he titled his book "real" Cajun. Link wanted to convey the joy and flavors and love he tasted from his family who truly lived off the land. When that land was devastated by Katrina, Donald Link lied, snuck, and cajoled his way back into the city that he loved. Nothing, not floods, National Guard, nor walk-in freezers full of rotting food was going to keep him from cooking. All he wanted was to get his restaurant, Herbsaint, open for those people who were determined to re-build. Re-build they did, as Link knew they would. Heck, in the midst of the turmoil he opened another restaurant, Cochon, and he still had time to write a cookbook! Recently, I was craving fried shrimp, but alas, the only shrimp I could find in West Virginia had been frozen for about a decade, maybe less, but i am guessing at least a decade. Since I couldn't make my own fried shrimp, the next best thing was read Donald Link and live vicariously. Place the shrimp in a medium bowl and season with 1/2 teaspoon salt and 1/4 teaspoon black pepper. In a separate bowl, whisk together the flour with the remaining salt, pepper, and the cayenne. Heat 3-4 inches of oil in a large pot until very hot, about 350 degrees F.
When I was a kid, fried shrimp were my go-to restaurant food. I refused to eat cocktail sauce and demanded French dressing for dunking. Not, perhaps, real Cajun, but a memory just the same.